The markets, it turns out, were expecting too much from the central government’s new telecom policy. Despite the fact that the country is going through a phase of policy paralysis, analysts were expecting clarity on a variety of issues, including spectrum pricing, spectrum refarming and roaming charges. The government’s department of telecommunications (DoT), however, has come out with only broad vision statements for the sector, without getting into the specifics of most of these issues. DoT has said that it will enact a separate spectrum Act to deal with issues connected to spectrum pricing, spectrum sharing/trading and refarming of spectrum, among other things. A new piece of legislature could take years before it is finally implemented. 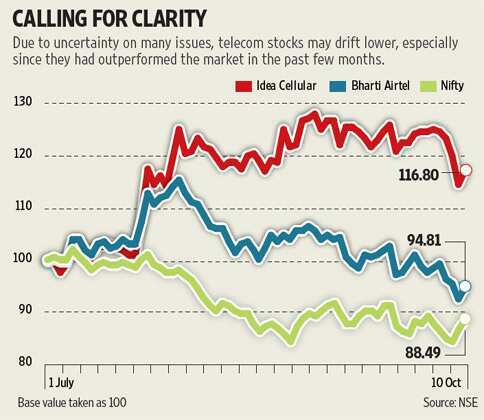 As such, the new telecom policy has little to influence telecom stocks in the near term. While there were some positive statements such as framing an appropriate exit policy and the mention of spectrum sharing/trading, there is no timeline set for any of these measures. Considering that the uncertainty on many of these issues remains, stocks may drift lower, especially since they had outperformed the market by a huge margin in the past one year. What’s more, there have been some recent downgrades in earnings estimates, and expectations from the September quarter results are running low. In sum, there’s not much for investors in telecom stocks to look forward to in the near term. The only glimmer of hope appears to be a positive impact of telecom companies’ recent efforts to raise tariffs.